Philippine President Rodrigo Duterte meets Defense Secretary Jim Mattis Oct. 24 at the 11th Association of Southeast Asian Nations (ASEAN) Defense Ministers' Meeting at the former Clark Air Base outside Manila. 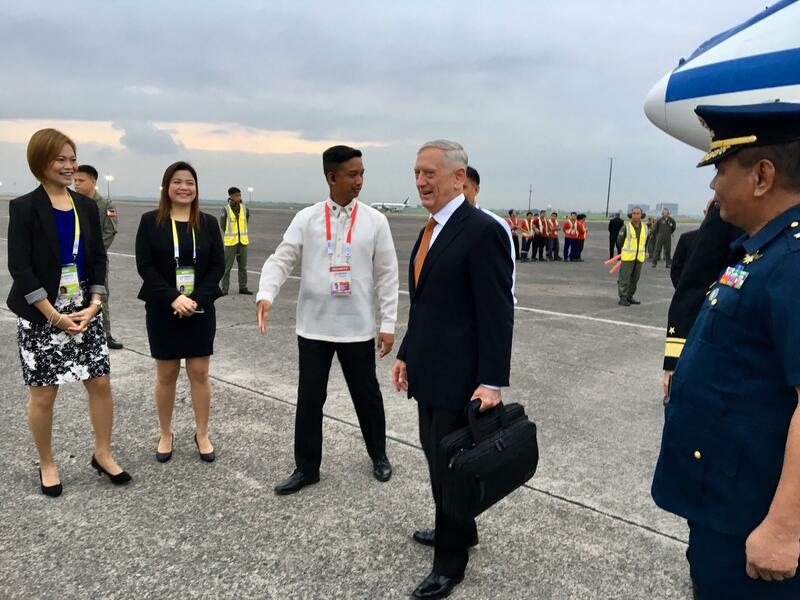 Defense Secretary Jim Mattis arrived in Manila on Monday. 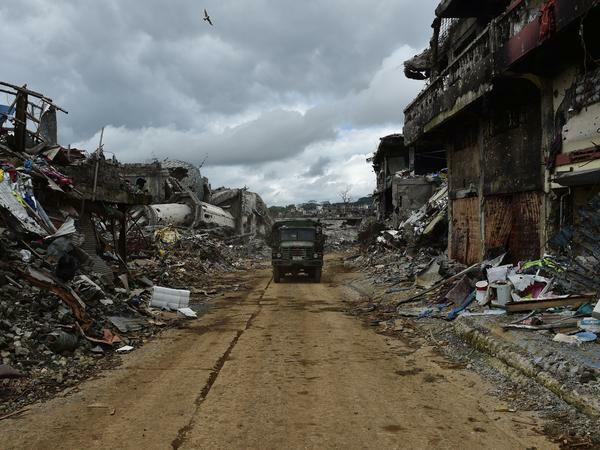 A military vehicle drives past bombed-out buildings in Marawi on the southern Philippine island of Mindanao on Oct. 25, days after the military declared the fighting against ISIS-inspired Muslim militants over. The steel-plated, modified Boeing 747 that Defense Secretary Jim Mattis travels the world on had flown west from suburban Washington, D.C., for 19 hours when it touched down Monday on an airstrip the U.S. once owned and operated. Clark Air Base in the Philippines used to be home to American bombers that pummeled Vietnam during the 1960s and early 1970s. And just as that ultimately futile U.S. intervention would become emblematic of a faltering American dominance in the region, so too is Clark Air Base now a ramshackle relic from another era, a time before the Philippines — the United States' oldest ally in Asia — reclaimed its sovereignty and politely showed the Americans the door. 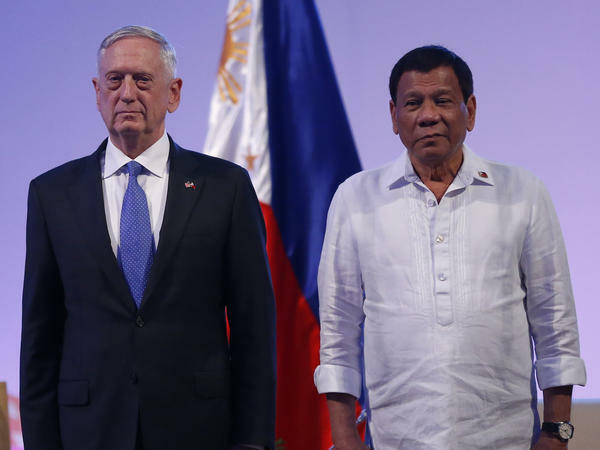 Mattis' trip to the Philippines had been billed as routine — a show of the American flag at an annual gathering of defense chiefs from 10 Southeast Asian nations. But it came at a time when things are anything but routine in that part of the world. Events there — primarily North Korea's sprint to nuclear warhead operability — are forcing the Trump administration to make real the pivot to Asia to which the Obama administration aspired. As it happened, the day Mattis landed might have showcased the U.S. as the still-indispensable nation in that part of the world. Washington had five months earlier dispatched military counter-terrorism experts, as well as spying technology and small arms, to help a severely tested Philippine effort to counter an ISIS-inspired insurgency in the city of Marawi on the island of Mindanao. But shortly after Mattis settled into his hotel at the old air base, Philippine Defense Minister Delfin Negrillo Lorenzana made an unexpected public announcement. "The Filipino government," he said, "aided by the government and massive support of the Filipino people, nipped the budding infrastructure and defeated terrorism in the Philippines." The siege of Marawi was officially over – but with nary an official nod of credit to the key American assistance in putting down the insurgency. Instead, Manila's official praise was reserved for Russia and China. Both had provided weapons that the Obama administration had failed to deliver due to concerns about Philippine President Rodrigo Duterte's violent crackdown on suspected drug traffickers. Beijing donated 6,000 rifles and 9 million rounds of ammunition earlier this year. Russia timed its gift of 5,000 AK-47 Kalashnikov rifles and 20 military trucks to coincide with this week's gathering of defense ministers – and perhaps the arrival of Mattis. As Mattis flew to Bangkok from Clark Wednesday morning, a ceremonial presentation of Russia's rifles for the Philippine military was underway on a Russian warship docked at Subic Bay – the site of another former U.S. military base. It certainly looked like a finger was being poked in Washington's eye. But Mattis insisted on the flight to Thailand that this was not the case. "I don't attach very much significance to it," he said of the Russian arms delivery. "You know, some trucks or guns being dropped off to help a country that's fighting terrorists right now... it's a sovereign decision by the Philippines." It's true that neither China nor Russia has had anything close to the historic relationship the U.S. has had with the Philippines. As Mattis noted about his one-on-one meeting with Duterte at the close of the defense ministers' conclave, "It was a very straightforward, even warm meeting that talked about the depth of our mil[itary] to mil[itary] relationship, and our collaboration together against our common enemy." But for Duterte, receiving weapons from such geopolitical rivals of the U.S. – even if their nominal value is minimal compared to American military aid – is a way to keep Washington from taking its longtime ties with the Philippines for granted. China's territorial expansion into the South China Sea, built on the sands of artificial islands it has created, is one more challenge to American dominance in the region. As the defense ministers met in the Philippines, the 19th Congress of China's Communist Party affirmed that nation's aim to dominate what China sees as its own backyard – the same Asia-Pacific neighborhood the U.S. has considered its sphere of influence ever since the end of World War II. There is one point all the defense chiefs gathered at the Clark base did seem to agree on: the danger that North Korea's nuclear dash poses to the entire region and the need to rein it in through peaceful means. "What was clearly highlighted there was how all the nations look at [North Korea's] actions as outlaw actions," Mattis said of the meetings he'd just attended. "I carried the message that the more we do together today, the greater the chance for enduring peace in the future." It was a tacit acknowledgement that the kind of American military might that once gave the U.S. preeminence in the Asia-Pacific region has its own limits. And that's why the administration Mattis works for will likely be forced to focus on this region more than President Trump might have imagined. The president will find out for himself when he visits the Philippines as well as China, Vietnam, South Korea and Japan, next month.